The AmDTuning.com with Cobra Exhausts team once again showed solid pace with a hat-trick of points scoring finishes as the Dunlop MSA British Touring Car Championship headed for Rockingham for round eight. The West Thurrock-based team headed for Northamptonshire eager to challenge towards the top ten at a circuit where it had impressed twelve months ago, with drivers Ollie Jackson and Ant Whorton-Eales confident of pushing for top 15 finishes. Tamworth-based Ollie enjoyed a fine qualifying session to put his Audi S3 on the seventh row of the grid, setting a best time less than a half a second away from pole position. Running inside the points throughout, Ollie would take the chequered flag in 14th spot despite struggling with tyre degradation in the closing stages of the race. It would be a similar story in race two, although the 33-year-old was able to fight his way forwards to twelfth spot; spending the entire race dicing for position just outside the top ten. Running on the harder compound Dunlop tyre in race three, Ollie would enjoy his best result of the weekend with eleventh spot and he now sits eighth in the Independents’ Trophy with two rounds of the season still to run. “It’s been a good, solid day and to be honest, I don’t think we could have got much more from it,” he said. “We’ve been able to learn a lot this weekend that I think will benefit us when we go to Silverstone for the next round, and have brought home three points finishes – whilst also making up a place in the Independents’ standings. “We suffered a bit throughout the races with tyre degradation which held us back as they went on, but in the early stages of every race, the car felt mega; it’s just difficult to overtake round here. For team-mate Ant, the weekend would prove to be one where his impressive pace went unrewarded, with unfortunate incidents in races two and three preventing him from scoring points. The Lichfield driver showed his speed in free practice where he put his car inside the top ten, and he then qualified 19th on the grid for race one – less than a tenth of a second behind Ollie. Having taken 18th place in race one on the hard tyre, Ant was working his way up towards the points at the start of race two before being forced off track – collecting a trackside hoarding in the process. Pitting behind the Safety Car to have the debris removed, Ant rejoined at the back of the field in 30th position but then showed his pace by consistently lapping as quickly as the leaders as he battled his way back to 18th again by the finish. 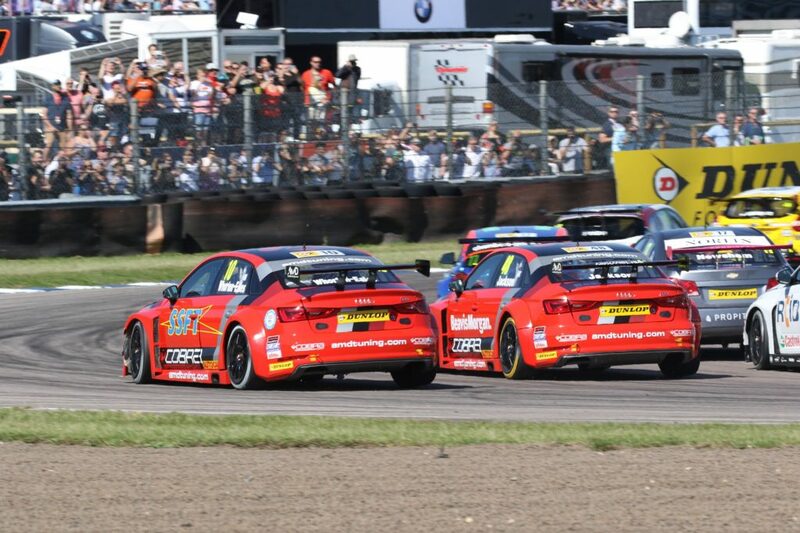 It meant Ant was well placed to push for points in the final race of the weekend, but he was unfortunately forced to retire having been caught up in contact between two of his rivals on the opening lap, with the damage sustained to the Audi being enough to put him out of action. “It’s another weekend where the end results don’t reflect the performance in the car,” he said. “We showed how quick we could be in practice but qualifying we so tight that we ended up in 19th place despite only being half a second off the quickest time. “Race one was solid enough on the hard tyre and we definitely had a points scoring car in race two before I got forced off onto the grass and I had no choice but to pit or the car would have overheated. When I rejoined I just got my head down and pushed hard to catch the cars ahead and could pick my way through to get close to the points.